Rare Kalamazoo Bats cabinet cards are housed at the NYPL as part of the famous Spalding Collection. They are the rarest of rare in the world of vintage baseball cards. The Kalamazoo Bats cabinet cards photographed by Charles Gross & Co. between 1886 and 1887 are almost impossible to attain for collectors who consider the Standard Catalog of Baseball Cards as the bible of card issue checklists and valuations. For decades the Standard Catalog has described the Kalamazoo Bats cabinets as one of the most elusive card issues of all-time and accordingly the set has been held in high esteem by collectors like Keith Olbermann who wrote an article about the them for Sports Collectors Digest in 2007. Olbermann’s article was primarily about the smaller K-Bat cigarette cards which featured players from several teams, but he indicated that the cabinet card versions featured only Philadelphia players. He referenced the work that hobby pioneer Lew Lipset had conducted over the years in compiling a checklist for both issues dating back to the publication of the Encyclopedia of 19th Century Baseball Cards and his newsletter, The Old Judge,in 1985. It was in his 1985 article that Lipset established the true rarity of the Kalamazoo Bats cabinet cards and since that time they have been highly prized by collectors. So prized, in fact, that it appears some of them have been pilfered from the New York Public Library’s famous Spalding Collection. Last week, Legendary Auctions withdrew one of the elusive cards from its current sale after they were notified it originated from the Fifth-Avenue branch of the library. Despite the fact that the checklist available to collectors shows that thirty-three different player cards are known in the set, we were only able to confirm that four cards of the Philadelphia National players have appeared at public auction. The remainder of the cabinet cards in the set are images of the Philadelphia Athletics of the American Association. It appears that the first Philadelphia Nationals (or Quakers) cabinet card to appear at auction was an example featuring the player George Wood in a 2001 Hunt Auctions sale. 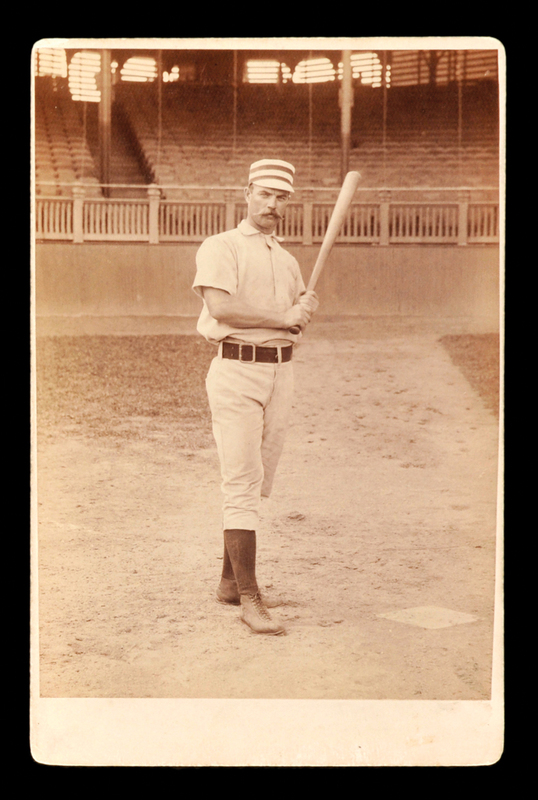 One of the few Kalamazoo Bats to appear at public auction was this cabinet card of George Wood. The reverse of the rare cabinet photo of George Wood offered at auction exhibits tell-tale signs vandalism that attempted to conceal ownership marks of the NYPL. But that’s not the case, as the New York Public Library’s famous Spalding Collection includes an identical K-Bat cabinet card of Wood that was originally part of Philadelphia manager Harry Wright’s personal collection. 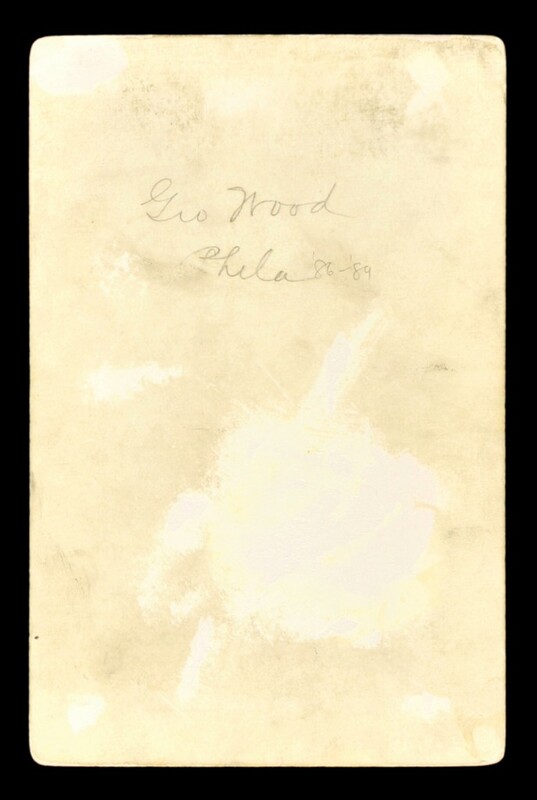 The reverse of that card was identified as depicting player Wood in what is believed to be Wright’s handwriting, and was stored in “Box 5″ of the photo collection, as evidenced by the numeral “5″ inscribed in the upper left hand corner. When Legendary posted an image of the back of their offered Wood cabinet, it was visible that the card had been vandalized to remove the tell-tale NYPL stamp and the numeral “5″ in the upper left corner, originally penned by baseball researcher Charles W. Mears. The handwritten pencil identification of Wood, however, remained. The auction house noted that the paper loss on the reverse was due to “early scrapbook mounting,” but it appears that the additional areas of paper loss were added to give the impression that it was removed from a scrapbook. When Legendary president Doug Allen was notified of this information by Haulsofshame.com, the card was immediately removed from the sale. 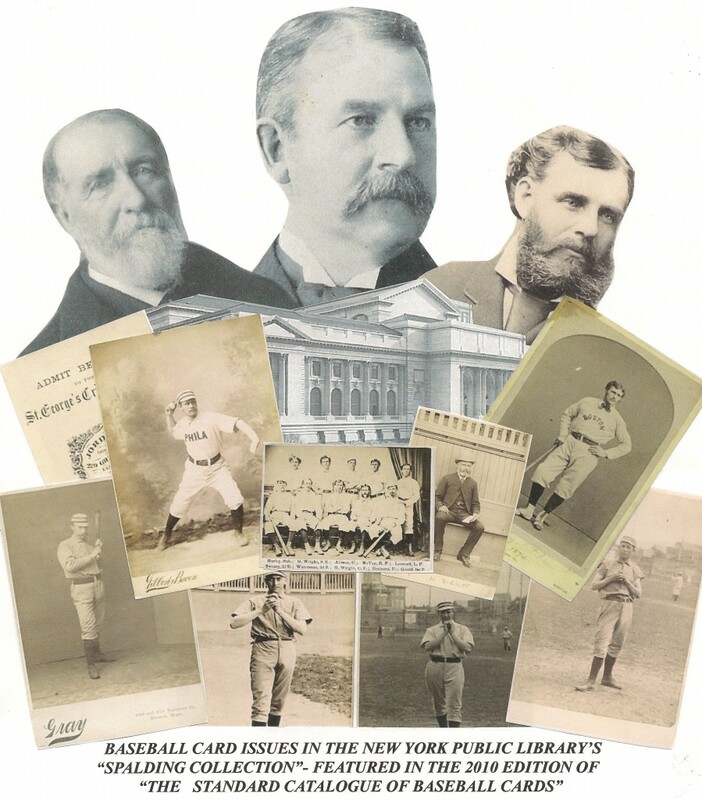 Sources indicate that the FBI will want to take possession of the card as part of their on-going investigation into the multi-million dollar heist of baseball relics from the NYPL’s Spalding Collection. The FBI recently took possession of another rare card of baseball pioneer Al Reach that was stolen from the NYPL and offered for sale on eBay. 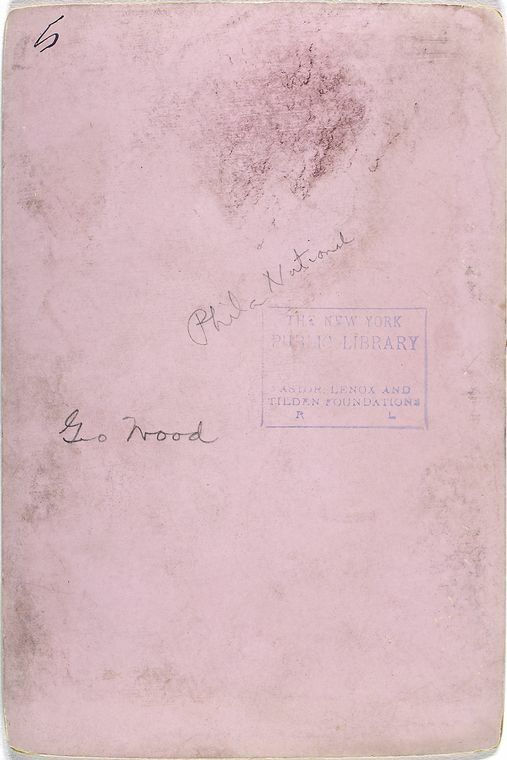 The reverse of the only other known K-Bat cabinet card of George Wood features the NYPL ownership stamp and the handwritten numeral "5" which denotes storage location at the library. The 1922 inventory of the Spalding Collection was published by the library and reveals that its collection originally documented the inclusion of twenty-six Kalamazoo Bats cabinet cards. They were identified as “Philadelphia” or “Cop. 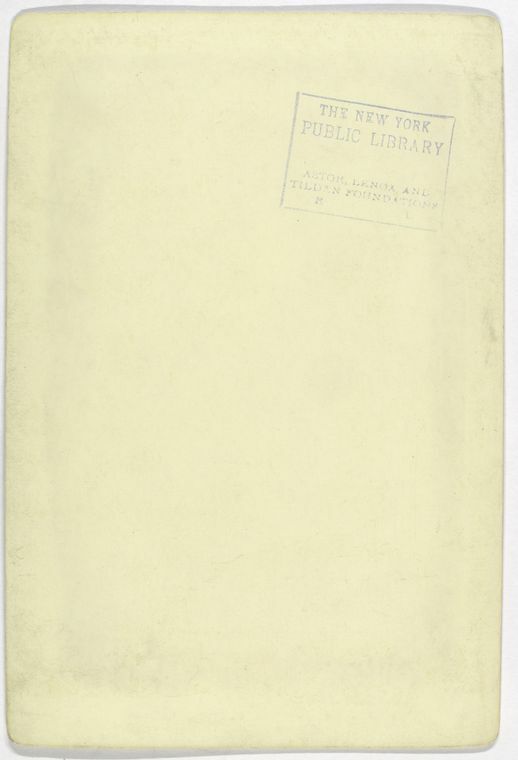 1887 C. Gross & Co.” on the inventory entries. It appears that Harry Wright, as manager of the Philadelphia club, received cabinet card examples of his players directly from photographers including Charles Gross & Co., Gilbert & Bacon, Gray Studios and MacIntyre. Each of these groupings of cards are recognized as sets in the Standard Catalog. Sources indicate that the FBI has already taken possession of several Gilbert & Bacon and Gray Studios cabinet cards that were also stolen from Wright’s personal stash. The entries depicted above represent the Spalding Collection's holdings of Gross & Co, Gilbert & Bacon and Gray Studios cabinet cards documented in the NYPL's 1922 inventory. An inventory of the Spalding Collection’s photographic holdings in 1987 revealed that scores of rare images had vanished from the collection and a “Missing List” was established indicating which cabinet cards or CDV’s were still part of the collection that was donated in 1921 by the widow of Hall of Famer Albert Spalding. 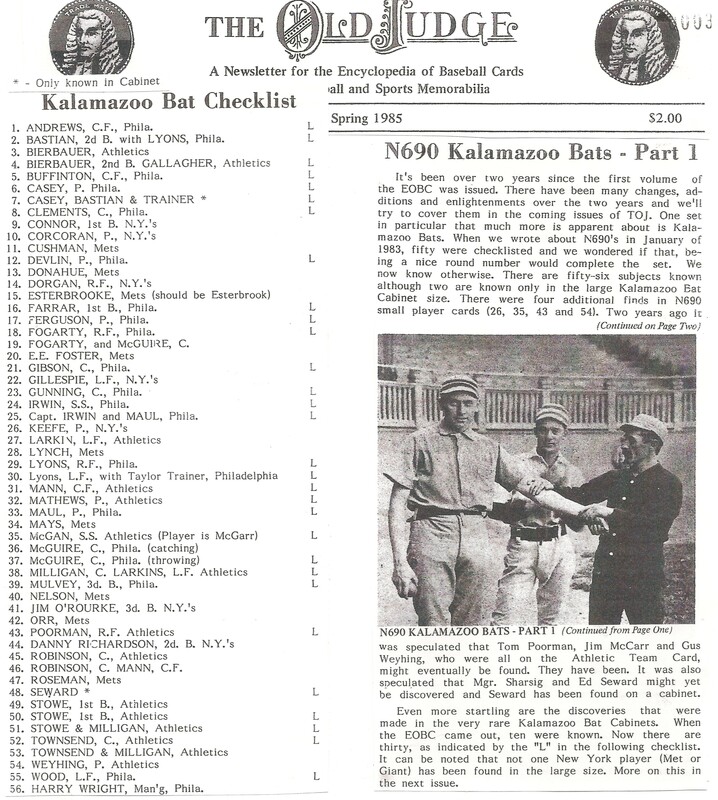 However, the library also discovered that the Kalamazoo Bats cabinet tallies accounted for on the original inventory were incorrect. 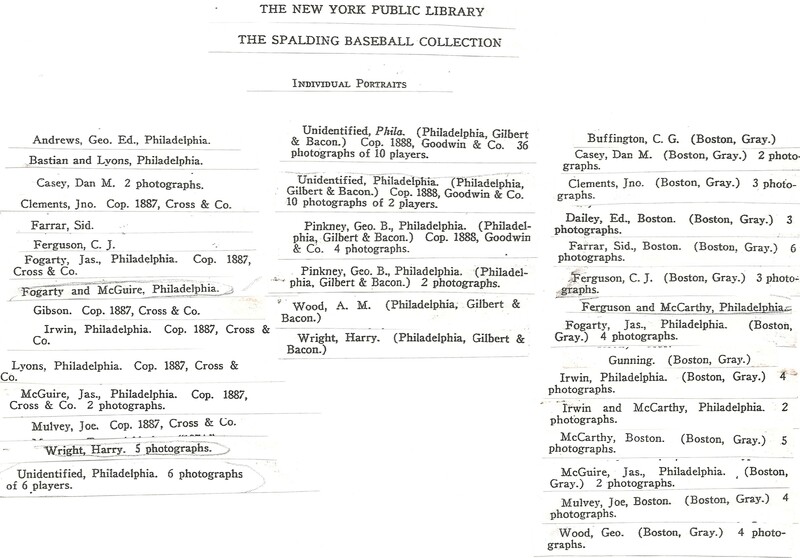 In many cases the library had multiple copies of Philadelphia NL players listed that had never been added to the inventory. For example, the library noted that they had only two K-Bats cabinet cards of player Dan Casey when, in fact, the 1987 inventory revealed they had twelve copies. The George Wood card removed from auction was never even documented on the 1922 inventory. In total, the NYPL inventory in 1987 established the library had nearly fifty K-Bats in their possession and another six cards definitively missing (with others suspected). Page from a report submitted to the FBI and NYPL by Haulsofshame.com in 2010 indicating that four copies of Harry Wright Kalamazoo Bat card are missing. The Harry Wright card is perhaps one of the most valuable and desirable cards in existence, rivaling famous cards like Babe Ruth’s Baltimore rookie-card in terms of rarity. It appears that the Wright card and the majority of NYPL’s Kalamazoo Bats cabinets are only known to exist in the Spalding Collection, so how could the Standard Catalog of Baseball Cards determine values and designate this issue as an actual baseball card set? The inclusion of the cards of the Philadelphia Athletics players in the set appear to be legitimate as they were originally acquired by Lew Lipset who once owned items that belonged to 19th century star, Harry Stovey. In one of his auctions, Lipset sold a scrapbook that once belonged to Stovey and stated, “Stovey gave many of his artifacts to (Warren) Goff including the majority of the Kalamazoo Bats cabinets known in the hobby today.” Lipset was not referring to the cabinet cards featuring the Philadelphia Nationals. Lipset also confirmed that he purchased additional K-Bats of the Athletics from another Stovey relative. But when Lipset published his 1985 checklist of K-Bats cigarette and cabinet cards he made no mention of the cabinet cards housed in the NYPL’s Spalding Collection. Each cigarette card which had a corresponding cabinet photo known to exist was designated with an “L” on Lipset’s checklist. As of 1985 Lipset indicated the existence of a Wood cabinet, but not one for Harry Wright. In his 1985 article Lipset wrote, “Even more startling are the discoveries that were made in the very rare Kalamazoo Bats cabinets. When the EOBC came out, ten were known. Now there are thirty, as indicated by the ”L” in the following checklist.” In 1983 Lipset noted that the Spalding Collection included several over-sized team K-Bat cabinet photos of the Philadelphia Nationals but did not mention specifically the existence of the NYPL’s K-Bats player cabinets. Lew Lipset's 1985 K-Bat checklist appeared in a Spring issue of "The Old Judge" and featured an image of a Philadelphia Nationals cabinet of Dan Casey and a trainer, which was never included on the original 1922 NYPL inventory. We asked Lipset how he determined the existence of K-Bats for Philadelphia National players on his checklist and if he incorporated the Spalding Collection’s holdings into his survey? Lipset responded, “I believe that was my first issue of The Old Judge. I obviously saw them, as I didn’t say anything existed unless I saw a picture of the item or the item. I can only think I might have seen them in the Spalding Collection, but I don’t remember seeing cabinets there at all.” Lipset also confirmed that he did not order a print or reproduction from the NYPL of any cabinet cards. If the cabinets Lipset included in his survey in 1985 were from the Spalding Collection, he failed to note the Harry Wright cabinet. To the contrary, if they were not included in his totals it is likely that many other duplicates from the NYPL were also wrongfully removed like the Fogarty and McGuire, Wood and Wright cabinets (and the one unidentified player cabinet). In Lipset’s 1985 Old Judge article he included an image of the K-Bat cabinet featuring pitcher Dan Casey with teammate Bastian and the team trainer. The NYPL never identified this cabinet on its 1922 inventory and today the library only has one copy of that cabinet. The image that Lipset used in 1985 appears to be a different example than the copy now at the NYPL. When asked for the source of that photo Lipset replied, “I didn’t even notice that was a Philadelphia Kalamazoo. I would assume it was owned by a collector who either gave me a photo or let me take one for the Old Judge article.” This scenario further suggests the possibility of additional thefts of uninventoried photos, and the examination of the backs of any K-Bats cabinets in private hands could reveal an NYPL provenance. One of the "unidentified player" K-Bat cabinets in the NYPL collection features player Tom Gunning. The reverse of his card has no inscription or identification. Another Gunning cabinet surfaced in a 2004 REA auction in "near mint condition." Light NYPL stamps like this one could be easily removed with professional restoration. Supporting that theory is the appearance of the Tom Gunning K-Bat cabinet in Robert Edward Auctions’ 2004 sale. In the NYPL 1922 inventory the Gunning cabinet was never identified and was listed as one of six “unidentified player photographs” that had no identification written on the reverse of the card. Of the six unidentified cabinets in the collection only five remain and two of those are of Gunning featuring a clean reverse and a light NYPL stamp. The REA Gunning cabinet was described by the auction house as being in ”spectacular, near mint condition,” but no image or mention of the card’s reverse was made in the lot description. (Some stolen NYPL items have had their ownership marks removed by professional restoration.) It is quite possible that many other duplicate K-Bats cabinets were removed from the Spalding Collection and, now that the Wood cabinet has been confirmed as a stolen item, the odds are far greater that this is the case. The stolen George Wood cabinet card that was withdrawn from Legendary Auctions’ current sale was first offered publicly at Hunt Auctions in 2001. David Hunt did not respond to inquiries asking who originally consigned the photo to his auction in 2001. 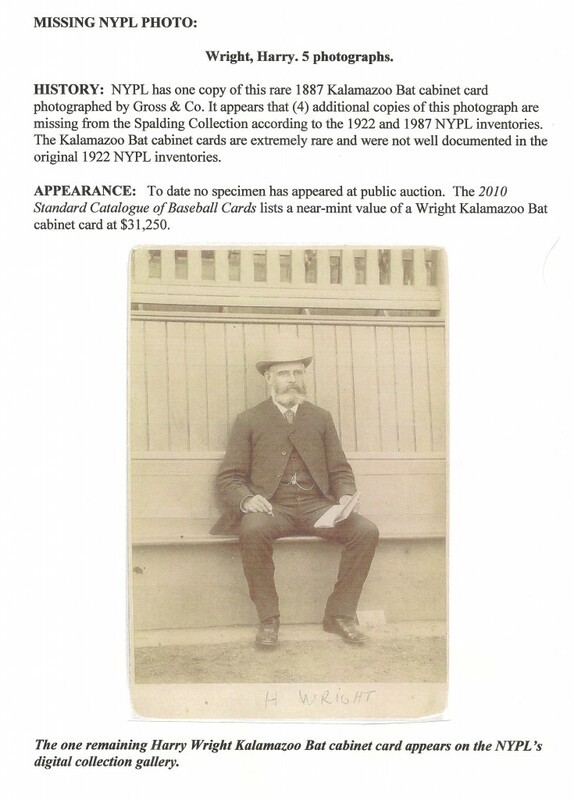 The current FBI investigation into the NYPL thefts was commenced in July of 2009 after Hunt offered letters addressed to Harry Wright that turned out to be stolen from the Spalding Collection. Sources indicate that at least one major collector of nineteenth-century material is in possession of a Harry Wright Kalamazoo Bats cabinet. With a value of $61,500 in the current Standard Catalog, the collector will likely be unhappy if the FBI ultimately takes possession of his prized card. Investigators will likely trace the chain of ownership of the ultra-rare card, but like most other items stolen from the NYPL, that trail is likely to lead to the collection of the deceased collector, Barry Halper, who once owned numerous items stolen from institutional collections including the NYPL, the Boston Public Library, State Archives of Hawaii and the Baseball Hall of Fame. Aside from the Wright cabinet and the handful of others confirmed stolen, what still remains as a mystery is whether there were more undocumented examples stolen from the NYPL as well. If there were other duplicate cabinets stolen from the Spalding Collection it is possible that a full set of Harry Wright’s Philadelphia Nationals may be buried in the vault or a showcase of a big-time collector. We asked one prominent collector of 19th-century cabinet cards what he thought the value of a grouping like that might fetch on the open market and he estimated a sale price between $150,000 to $200,000. It is likely that the FBI will take possession of the Wood Kalamazoo Bat cabinet which will join a host of other stolen items they have already tracked down as part of their two-year investigation into the Spalding Collection thefts. Sources indicate that the FBI is well aware of the collectors who are in possession of scores of other items stolen from the NYPL and that it is only a matter of time before agents and US attorneys track them down. Another source close to the investigation confirmed that the NYPL probe has been very active since the FBI took into their possession the stolen cabinet card of Al Reach that appeared for sale on eBay. Boy, that thief Halper, sure made his rounds. Here is a perfect example of bringing in the proper agency to handle the thefts.Now why hasnt the HOF done the same thing,HUUUUUUMMMM,you dont think maybe a investigating agency such as the FBI would uncover some inside work ,huuuuuuuummmmmmm ? where oh where is harry??? It’s interesting how the most knowledgeable collectors and dealers have such fuzzy memories when it comes to stolen items from the Spalding Collection. Just sayin. This is one awesome blog.Really looking forward to read more. Awesome…. If you are referring to Lew, give the gentleman a break. He was being asked, going on memory, his opinion for the record. He didn’t have his notes anymore. What do you expect from the guy?